and eco-tours and helicopter tours departing from the resort. NA (resort’s location is remote). 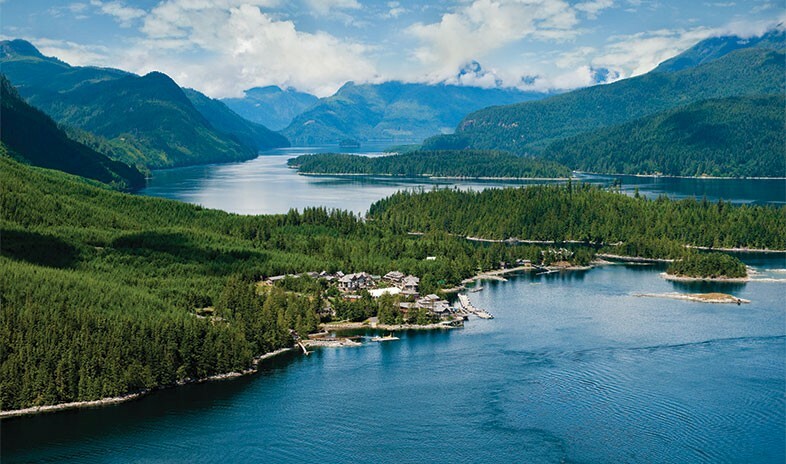 Nestled deep in the heart of British Columbia’s famed Inside Passage, Sonora Resort offers the height of comfort and refinement, combined with unparalleled beauty, adventure, and amenities. Accessible only by air or water and seasonally from May through October, the property gives guests the perfect wilderness retreat in an ancient, old-growth rainforest archipelago, providing uncompromising eco-adventure experiences such as world-renowned fishing, wildlife viewing, and more. Sonora’s five-star facilities feature premium appointments and breathtaking views from every room. In addition to 12 lodges with 88 total accommodations, two luxury villas are set deep in a secluded forest to provide more privacy and inspiration. Groups can reserve a cluster of lodges, and those booking at least 65 rooms can have exclusive use of the resort. Sonora’s modern and impressive business amenities include three rooms in a Salish longhouse, plus four divisible spaces at the Innes Conference Centre. After a productive day of meetings, attendees can relax and recharge at the luxurious Island Currents Spa, which has a soothing mineral pool, sauna, and Swiss shower, as well as enjoy the acclaimed menu and wine cellar of the Tyee Dining Room. British Columbia also offers the best outdoor team-building opportunities on earth. Whether celebrating past successes or inspiring new ones, corporate guests find incomparable adventures, including fishing and wildlife viewing by boat or helicopter, kayaking, river rafting, glacier tours, cultural tours with local First Nations, and more.